The aggregate industry is defined by the processing and movement of extremely abrasive wet or dry materials, usually by a network of conveyors. This process may also include equipment to pulverize, shape, clean, or otherwise sort the aggregates. Due to the abrasive nature of these materials, wear is a major concern on expensive equipment. Redco products have supplied viable, downtime-reducing, solutions for this industry over many decades. The primary workhorse is Redco polyurethane. This elastomer has extremely high wearing properties and can thrive in abrasive environments involving virtually any wet or dry aggregates. The applications are too many to name but conveyor and hopper lining are two of the largest. When used as a liner, urethane protects the metal equipment and handles the wear of being in direct contact with the aggregate. 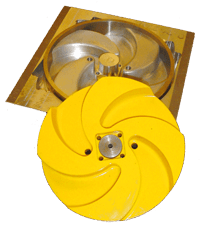 However, polyurethane can essentially be used anywhere this wear occurs, including the area the aggregate first contacts the conveyor to any discharge chutes. Contact us with details of your application in order to get a recommendation of the optimal grade of urethane. Some polyurethane products actually exist specifically for aggregate including the innovative Redco Switchblade belt scraper with its replaceable and Redco Green Screens. A few more notes. Rubber has significant applications in this industry as well, primarily as belt skirting and in areas where constant vibration is a concern. For slurry applications specifically, the Redco VYPUR series of pipe sections and elbows provide exceptional service life above and beyond metal in abrasive or corrosive applications. It’s best if customers reach out directly to us for a consultation, so if you’re involved in the aggregate industry and are looking for some solutions to maintenance costs and downtime, please contact us today. Redco Forklift socks are an upgrade over traditional low-grade cold bonded rubber socks. A “forklift sock” is an elastomer solution that provides a covering to forklift forks, this makes them less likely to damage sensitive equipment being lifted. The problem is that the rubber sock covers easily delaminate from the forks and can also crack. This creates a situation where the loose sock causes an unsafe lift. Unlike the cold bonded rubber, our solution uses a proprietary 90A polyurethane in a “hot bond” to the metal socks. This is a superior way of applying a sock solution and will vastly outwear rubber socks. In addition, our material is colored “safety yellow” for high visibility. The product reduces the risk of driver error and material damage while greatly improving grip when lifting. Redwood Plastics and Rubber can provide this service in two ways. Firstly, you can ship your existing steel forklift socks to our Langley, BC, Canada facility and we can re-coat the socks in-house. Alternatively, we can machine the complete new steel socks, coat them, and send them to your facility. For a quotation on your forklift sock needs please contact us today. Plastic Plow Blades & Cutting Edges – Saving The Paving! One of our employees recently took a couple photos after parking at an area we won’t disclose in Metro Vancouver a day after a recent snowfall. Upon pulling into his parking spot he noticed that every single stall had a large pothole where the snow had been pushed. Having been a weekly visitor to this lot he knew the holes were not there a few days before and therefore must have been caused by the snow removal contractor. The damage is extensive and will be a huge headache to fix! How much money will it cost to repair? What will happen to the reputation of this snow removal vendor? And it was a completely avoidable disaster that never needed to happen. Industrial plastic plow blades (or “cutting edges”) have been used for years to prevent this sort of issue. The cutting edges, made of polyurethane, rubber, or UHMW, are simple rectangular strips that are bolted to the bottom of a metal plow or bucket. Therefore it is this softer, non-damaging, plastic surface that actually touches the ground as the equipment scrapes and pushes the snow instead of the metal blade. There are multiple ways the metal-on-pavement contact can cause damage as besides creating potholes the blade can also destroy things like lights or reflectors embedded in the asphalt. Such as is common at airports for example. The blades are an investment: even the least expensive blade will be at least a few hundred dollars. But how much is that few hundred dollar investment compared to losing contracts, a hit to your reputation as a contractor, and even potential lawsuits? The simple fact is you are “playing with fire” if you don’t have a high-quality plastic cutting blade – it’s an investment that must be made! Several plastics with different prices, properties, and suitability to applications are available so please contact us with the details of your application. Hoses on your equipment being worn or abraded? Are you having issues with kinks, weathering, or chaffing which results in premature hose wear? Redco Second Skin may be an affordable solution. 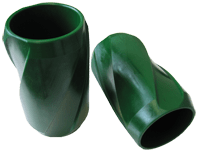 Redco Second Skin Hose Wrap is a polyurethane product that stretches around your vulnerable hoses with its unique expanding design. It’s available in several colors with black being the most popular. The wrap serves as an armor: absorbing the UV-light from the sun and taking the abrasion and wear that would otherwise be applied to your hoses and it helps keep them from tangling. The light duty version of the wrap is available in diameters of 1/8″-1″ with each of those being available in a 100 foot coil only. The heavy-duty wrap is available in diameters of 1/2″-6″ and the length of the coil in the box differs based on how large the hose wrap is. Orders on the heavy-duty wrap also have free shipping anywhere in the continental U.S. as an added incentive. Most profiles have plenty of stock and ship 1-2 days after receipt of order. To view our Redco Second Skin Hose Wrap brochure, click here. To contact us for a quotation on your hose wrap needs email us today. We stumbled on a really neat article recently about a new patent by Windspeed, an aerospace company. The patent is for a bubble-type viewing area on the top of an airliner, where a couple of seats would move up into the bubble giving the passengers an unobstructed 360 degree view. To see pictures and a video on CNN click here (clicking will not take away from this article). This bubble will almost certainly be plastic and plastics have a long history in aerospace applications dating back to the 1930’s and 40’s. One of the first acrylic applications was World War II aircraft canopies. Acrylic had been developed around 1930 and was found to be easily processed and shaped. It was about 8x stronger than glass and had natural UV-resistance to weathering (unlike many other plastics) and so was suitable for aircraft where strength and being lightweight was key. As much of a revelation as acrylic was, it still had some deficiencies – namely its impact strength was less than desired, and certainly not bullet-resistant, and it also scratched easier than conventional glass. Fortunately, there was another plastic available which could correct some of these deficiencies: polycarbonate. Polycarbonate had extraordinary impact-resistance and yes, could be made bullet -resistant (modern “bullet proof” glass is polycarbonate). Polycarbonate; however, had deficiencies of its own: it was prone to scratching and worst of all, would yellow and crack with sun exposure affecting visibility and even structural integrity. Canopy manufacturers appear to have solved this problem with an innovative solution. Canopies are now often laminates, in that they have an outer acrylic shell (which can handle UV-exposure) with a polyurethane film (for absorbing UV-light) and polycarbonate underneath. This provides the “best of both worlds” as the polycarbonate core can provide its strength without the threat of scratching or weathering which would otherwise disfigure the canopy. Given the application would require strength and optical clarity, it’s very likely the new dome manufactured for Windspeed’s bubble will be a similar laminate. For a quotation on your acrylic or polycarbonate needs, please contact us. Oil and gas development is booming in North America. This has caused an increased demand for premium parts using engineering plastics with one such application being urethane centralizers. These centralizers play a key role in the oil and gas extraction by keeping centering the equipment traveling down the borehole. These parts are custom and often different firms we work with will purchase their tooling along with their centralizers. In general, centralizers are made from either Redco™ 750 or occasionally, 60D. The benefits of urethane mean these centralizers are easily molded to any desired shape polyurethane itself has an excellent reputation as a workhorse of the oil and gas industry – urethane is able to take a beating and resistant to oils, chemicals and solvents. Please contact us for assistance with our Redco™ centralizers. More information on our other oil and gas products can be found here. Polyurethane is a versatile material available from eraser soft to bowling ball hard and suits a variety of applications for dipper door blocks to deadplate to lubricated bearings. 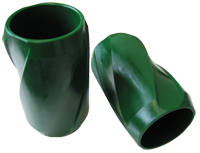 Critical to the properties of the urethane is whether it is polyether or polyester based. 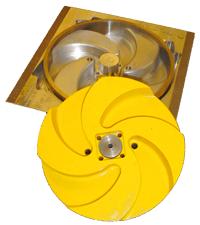 The two have different advantages and disadvantages and are suitable for different applications.